Take the hassle out of any demolition demand with the help of Spring Demolition Wrecking. 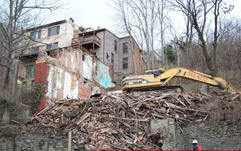 Spring Demolition is insured, bonded and also provides workers’ compensation. With our insurance and security guarantees, you can rest assured knowing you’re making the right choice on your demolition service needs. Contact one of our representatives today at (513) 543-2389 in the Greater Cincinnati and Northern Kentucky areas for an estimate on your Demolition Wrecking, Site or Land Clearing needs. $5000.00 minimum projects only. Demolition and Wrecking Services, Contract Demolition of Buildings/Structures in Greater Cincinnati and Northern Kentucky areas since 1970.